The busyness of modern airspace poses significant challenges for air traffic controllers. 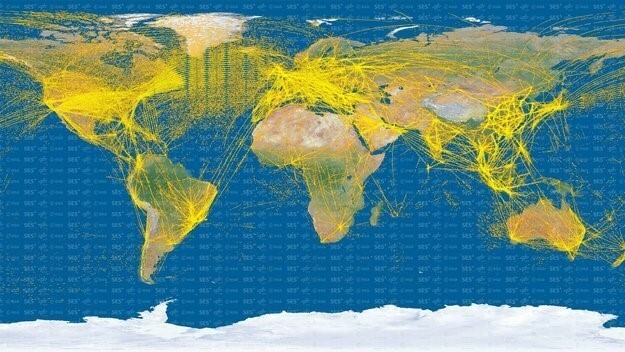 Some 100,000 flights take off and land every day across the world. If you’re struggling to visualize this incredible volume of daily air traffic, this animated map might help put it into perspective. The map simulates the route of every commercial flight over a 24-hour period based on arrival and departure data from the FlightStats website. Each flight is represented by a tiny yellow dot. The original version was created back in 2008 by Karl Rege and his team at the Zurich School of Applied Sciences and reposted as a four-second animation on Metrocosm.com. The map highlights the sheer volume of global air traffic. Both the US and Europe become a sea of yellow during daylight hours. You can also see the direction of travel between Europe and North America – generally towards Europe during the night, and then the reverse during the day. Other interesting patterns emerge in Australia and the Far East. The extent of coastal settlement in Australia is made clear – especially in the south east of the country. In Asia, significant air travel is seen in the Far East – particularly in China and Japan. Conversely, Africa sees much lower volumes of air travel. In May, Raphael Kuuchi from the International Air Transport Association (IATA) highlighted the work needed to boost aviation across the continent. He points out that London to Athens and Algeria to Cameroon are roughly the same distance, as the crow flies. However, when it comes to journey time, a very different picture emerges: London to Athens takes roughly three and a half hours, while the fastest route from Algeria to Cameroon, via Istanbul, is approximately 24 hours, with three separate take-offs and landings. The busyness of modern airspace poses significant challenges for air traffic controllers. But help could be on the horizon – from space. The European Space Agency’s Proba-V is primarily designed to monitor vegetation growth. However, the mini-satellite (it’s smaller than a cubic metre) can also monitor air traffic movements. Although not yet ready to be used commercially, such a system offers the potential to track and coordinate aircraft movements in areas not covered by radar. This would allow distances between planes to be lowered, boosting global air traffic capacity and at the same time improving safety.